In the setting I'm working on, I want to have a vast 'sea' of diamond dust that is sustained by some kind of chilling magic effect that's spread across the surface of the land. Since magic is involved, I can always hand-wave some of the details aside, but I'm wondering more generally: How large and how intense can a source of cold get before it starts dramatically altering the global climate. It's different from any actual artificial sources of cold, because they all produce more heat overall, and just localized cold. Assuming that the region is never allowed to heat up above freezing point, and it is sufficiently large to contain the requisite volume of ice, my suggestion is that it is going to act as a permanent cold trap. The result of this is that over a sufficient period of time, all moisture in the atmosphere will end up frozen and locked up inside the region. Unless there's a mechanism that I'm overlooking, there will be a certain timeframe in which every molecule of water will have passed into the region and become locked up, rendering the atmosphere devoid of all moisture. So in the normal Earth ecology, heat is constantly being introduced by the primary source of energy in the solar system; the sun. That heat is effectively trapped in the atmosphere by what we call the greenhouse effect; certain gases actually trap certain wavelengths of the light and heat from the sun in the atmosphere, which warms up to an equilibrium temperature at sea level. The more of what we call greenhouse gases are in the atmosphere, the more heat that's trapped, and the hotter that equilibrium level is. Hence, global warming. What you say about 'artificial' cooling is correct; you're effectively extracting heat from a localised area, but net heat in the atmosphere is increased. Usually via greenhouse gases used to generate the energy to do this in the first place. In your scenario however, you've got a perfectly environmentally friendly way of keeping the core temperature of the planet cool. So, in that regard, if the sun is still shining on the earth and the temperature is kept even (and above freezing, 0oC) then your cooling will never have a material effect on the ecology because the sun will counteract the work of your cooling magic, and you're not using it at a level that can overwhelm the sun. So, how much energy is that? Well a useful estimate of the sun's heat output that directly hits the earth at sea level is 1KW/m2 per day. If your cooling magic is absorbing or removing anything up to 950 W/m2 you're probably fine. Plants aren't that efficient with their photosynthesis, and only use about 1% or 2% of the sun's energy for their endothermic reactions. Leave about 5% of the sun's energy coming through to be sure, and you're okay. Anything beyond that and you're not going to have enough energy left for the plants. I want to stipulate here that because we're using magic, we're NOT talking about dimming the sun to 5% of its current output reaching the earth; we're talking about 95% of the sun's energy being dissipated if it isn't captured by plants, solar panels, or the like. Cooling in this instance is about the removal of all the excess or reflected energy, not the actual light energy that plants need (and reflect most of anyway). Anything beyond that and the sun is fighting a losing battle, and eventually, your world will snowball and die. Interestingly enough; if your cooling magic works by directly manipulating the amount of greenhouse gases in the atmosphere, all bets are off. The simplest and easiest way to 'magically' cool an entire planet would be to remove CO2 from the atmosphere, and also other greenhouse gases like methane. If your magic actually generates its effect by magically removing these gases from the atmosphere, then even a small change can cause a massive amount of damage to the ecology, which is what we believe happened during the snowball earth epoch in the Earth's history. Of course, if that's the case, then the good news is that you can counteract this effect through industrialization. Ironically enough, this magic could be the cure for global warming by counteracting the carbon emissions of modern life and forcing the inhabitants of your planet to thrive and grow and progress using all the fossil fuels they want - otherwise, they'll freeze. It depends on where in the world you are. If you do this over Antarctica, you can probably cover half the continent without much noticeable effect on global climate for decades, as long as you don't touch the shores. 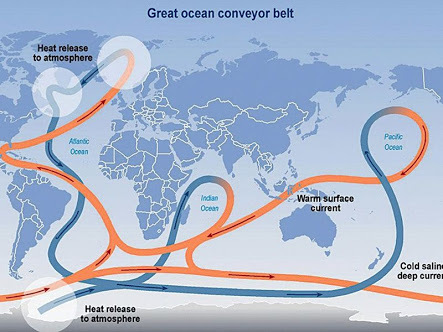 Global warming [Renan's note: or your magical diamond dust cloud, in this case] could, via a shutdown of the thermohaline circulation, trigger cooling in the North Atlantic, Europe, and North America. This would particularly affect areas such as the British Isles, France and the Nordic countries, which are warmed by the North Atlantic drift. Major consequences, apart from regional cooling, could also include an increase in major floods and storms, a collapse of plankton stocks, warming or rainfall changes in the tropics or Alaska and Antarctica, more frequent and intense El Niño events due to associated shutdowns of the Kuroshio, Leeuwin, and East Australian Currents that are connected to the same thermohaline circulation as the Gulf Stream, or an oceanic anoxic event — oxygen (O2) below surface levels of the stagnant oceans becomes completely depleted — a probable cause of past mass extinction events. The north would be cold for a few decades. When the oceans become stagnant, every ecossystem in the world will collapse. After the tundras and rainforests are all dead, the amount of methane in the atmosphere will increase ever faster and the climate on Earth will be venusian for millenia, maybe millions of years. Not the answer you're looking for? Browse other questions tagged magic environment climate temperature climate-change or ask your own question. What does a Dracula-esque villain need to maintain a magical castle and a variety of minions? How cold can a planet actually get? Other than magic, how can a cold-blooded race survive in an arctic climate?